Using clips from Casablanca as a launch pad for discussion, 'A Beautiful Friendship' is designed for individuals and groups to engage with the themes of Lent in a new and fresh way. The romance-fuelled movie set in the height of World War II touches on many important themes such as sacrifice, repentance, and hope. The course comprises five weekly sessions for groups meeting during the season of Lent, exploring: Waiting in the wilderness; Lamenting and lost love; Seeing God's bigger picture; Standing up for our beliefs; The power of self-sacrificial love. Paul Kerensa (comedy writer for Maranda and Not Going Out) and his wife Zoe Young - both small group leaders at their church in Guidford - masterfully weave these famous scenes into their lent course. Using clips from the film, discussion starters and insightful reflections the course will inspire and challenge Christians to revisit the Easter story from a different perspective. Each session is designed to last 60-90 minutes but is split into two halves, so leaders could run ten shorter sessions if they wish. Casablanca Lent Book and DVD Value Pack was published by Eden bundles in January 2015 and is our 15781st best seller. 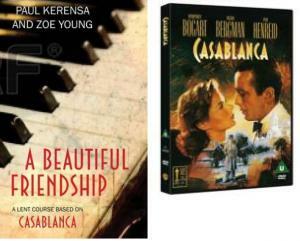 The ISBN for Casablanca Lent Book and DVD Value Pack is EDENBUNDLE-1631. Be the first to review Casablanca Lent Book and DVD Value Pack! Got a question? No problem! Just click here to ask us about Casablanca Lent Book and DVD Value Pack.